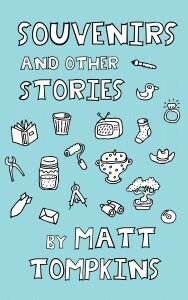 Matt Tompkins’s new book, Souvenirs and Other Stories, officially launched last month in paperback format. Today, the ebook version officially goes live. Get the Kindle edition of Souvenirs here. To celebrate the ebook launch, we’re also unveiling the “Dis/appearances” theme, guest edited by Matt Tompkins. The “Dis/appearances” pieces will appear (pun intended) throughout the weekend. We’ll be posting one story per day beginning later today! Check back this evening to read the first piece.